Roppe® Pinnacle Sanitary Toe Rubber Wall Base is ideal for high safety or hygienic commercial or residential applications. Made from 100% Type TS Pinnacle rubber this wall base is the professional's choice. Highly durable and extremely flexible - allowing for easy installations around columns, corners and architectural curves. Need an Adhesive? Click here! ! Koffler has what you need. I am looking for something to put in a mechanic room in a home. The mechanic room has a hot water tank and a GEO Thermal Unit. My 4 year old hot water tank malfunctioned and flooded my house. I am looking for a trim that would keep water from coming back in my house. Would this work? I was home when this happened but it was in the middle of the night. I thought I made a mistake, so I called 10/26 and cancelled the order. But, now I,m not sure. I wanted 4� high and 4 feetlong. If it is what I want, please fill the order. With my deepest apologies. Hi, Can you tell me how lon is each side of those outside corners and if possible send me a picture of those corners. Thank you. Roppe Pinnacle Sanitary Toe Rubber Wall Base is ideal for high safety or hygienic commercial or residential applications. 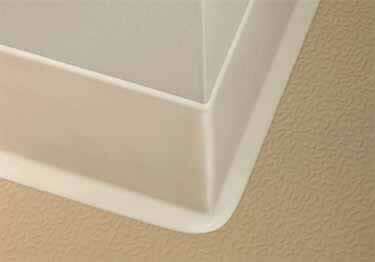 Made from 100% Type TS Pinnacle rubber this wall base is the professional's choice.